The kids wake up in a room full of toys and not a single adult in sight. It’s a dream come true with no parents, no school, and no rules–but something’s obviously not right with this room or the children who were already in it. And while some may like to live forever in this toy-filled utopia, the price for their fun may be their lives if they can’t figure out the way home soon. 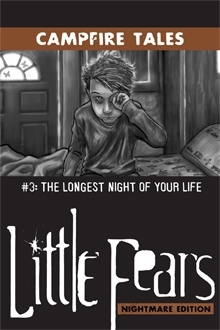 The Longest Night of Your Life is the third in the CAMPFIRE TALES series of monthly standalone episodes for use with Little Fears Nightmare Edition. LFNE Campfire Tales #3 is available at RPGNow.com.